Joseph O. Baker and Buster G. Smith. American Secularism: Cultural Contours of Nonreligious Belief Systems. NYU Press, 2015. Joseph O. Baker and Buster G. Smith’s book American Secularism, published in 2015, is an excellent work in the sociology of religion, one that addresses a gap in the literature. Few studies have focused on the question of non-religiousness as thoroughly as this one. For readers who connect diminished levels of religiosity with secularization or secularism (and these types even crop up among sociologists of religion), the title of this review may come as a surprise. The title is warranted by the central thesis of Baker and Smith’s book, namely, that secularism and religion are two dimensions of the same phenomenon, or more precisely, they represent two endpoints on a continuum of faith. 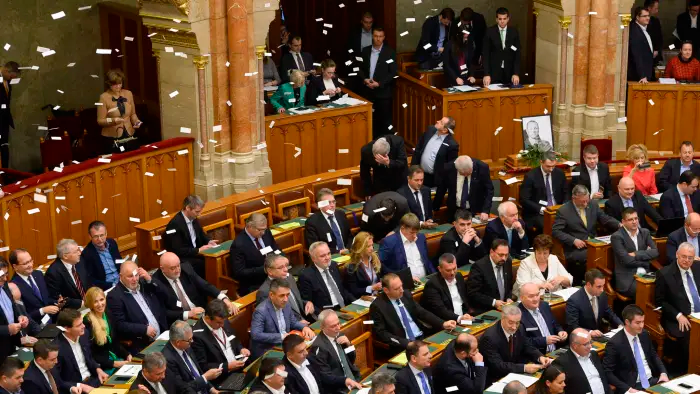 International criticism of a new Hungarian law targeting the operation of Central European University has been unprecedentedly severe – and that’s saying a lot, given the harsh criticisms Viktor Orbán’s government has received in recent years. The President of Germany has spoken out publicly in defense of CEU, and even President Trump’s State Department issued a critical statement. Meanwhile American news outlets, from the mainstream New York Times and Washington Post, to the conservative leaning American Interest and the leftist Vox, have all covered the story critically. The severity of the criticism mirrors the brazenness of the law. Although Viktor Orbán has been chipping away at democratic institutions since assuming power in 2010, this newest attack on Hungary’s most prestigious university, a symbol of Hungarian-American friendship, and bastion of high caliber intellectual inquiry, has crossed a line so obvious that even Hungary’s apologists are at a loss for words. If in the past Orbán could work to explain away suspicious legislation, he has been unable to produce even the most superficially plausible explanation for “Lex CEU.” The most frequently offered explanation, namely, that CEU is the instrument of a world-wide liberal conspiracy orchestrated by the rich, evil genius of Jewish descent, George Soros, is too outrageous to dupe even the most gullible foreign observer. North and West of the Danube, Hungary is universally perceived as an autocratic regime. Freedom House now ranks Hungarian democracy below Bulgaria and Romania. History is full of surprises, irony, and unintended consequences – which is one reason those who study history know better than to make predictions. Since, however, I’m not a historian, I’m foolish enough to make a few specific predications about things that will happen during Donald Trump’s first term as President. I’m even foolish enough to put these down on record, so you can call me out and rub it once history proves me wrong. If events prove me right, however, then I’ll clearly deserve to be the next President. 4. Due to his utter lack of political experience and erratic temperament, President Trump will be unable to deliver on the promises made to his base. Democrats will make notable gains in the 2018 mid-term elections, which will exacerbate tensions between traditional and Trumpian Republicans. The Republican Party will start to fissure and possibly split. Immigration presents us with a moral dilemma familiar in other circumstances: the challenge of weighing our particular obligations against our universal obligations to all human beings. We should think of ourselves as having special obligations toward our fellow countrymen and countrywomen, but there is a point at which the demands of universal charity outweigh special relationships. We can justify immigration restrictions and need not accept all comers if the pressures become more than we can bear without doing injustice toward those with a prior claim upon us. Yet the demands of universal charity also keep breaking in upon us, and we must recognize also the claims of those whose need is desperate. George Marsden. C.S. Lewis’s Mere Christianity: A Biography. Princeton University Press, 2016. A biography of a book may seem like a rather strange beast, but something like that is what Princeton University Press provides in its “Lives of Great Religious Books” series. With this offering written by the well known historian of religion, George Marsden, Mere Christianity takes its place in the series alongside books as different as Calvin’s Institutes, the book of Job, and the I Ching. Given the relatively brief “life” of Mere Christianity–compared, for instance, with the three examples I offered of other volumes in the Princeton series–Marsden prescinds from labeling the book a classic. But when one considers that it has been translated into at least thirty-six languages, and that in the last fifteen years alone it has sold over 3.5 million copies just in English, it is hard to deny that Mere Christianity merits inclusion in the series. Ukraine has been riven by civil strife. These are more than political events. They touch upon the most fundamental experiences of conscience and dignity. They reflect an awakening of civil society—and a reaction that seeks a return to ­­state-dominated public life. The future of the country hangs in the balance. What is needed ­today, not only in Ukraine but in every post-Soviet country, is church leadership that is clear-minded about the perils of an excessively close relationship between Christian witness and state power. The single greatest imperative is to encourage and engage civil society. If these are Trump’s supporters, we can begin to see that the strength of his support draws on something more than hatred and bigotry. Trump’s core constituency may have concluded, reasonably enough, that its fortunes are not likely to improve with either a Republican or Democratic President. Insofar as working class voters have deliberated about the candidates within the horizon of their own self-interest (and which political constituency doesn’t deliberate this way), why wouldn’t they vote for Trump? The newest issue of Principium has just been released! To purchase in the United States click here, in Europe here, and the UK here.